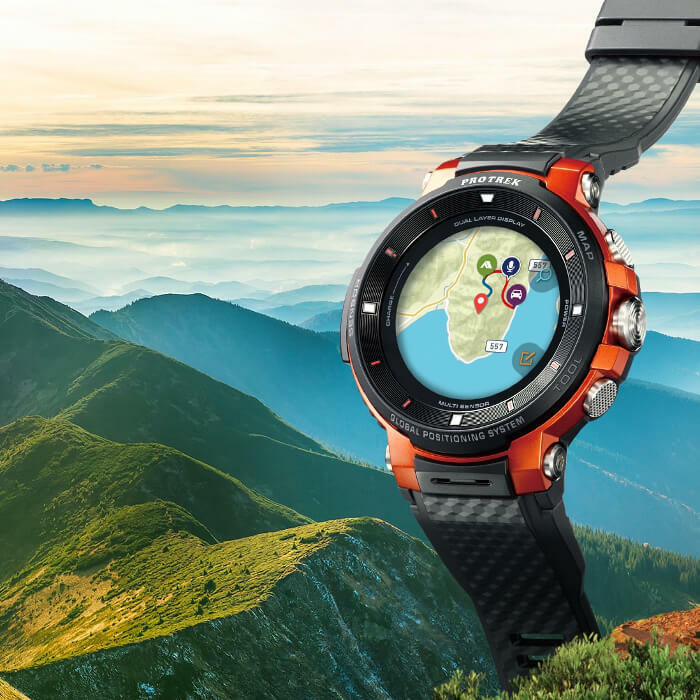 Casio revealed the upcoming third-generation Pro Trek Smart WSD-F30 outdoor smartwatch at a press conference at the IFA 2018 tech expo in Berlin. Like the previous WSD-F20, the WSD-F30 is a 50-meter water-resistant and MIL-STD-810G-compliant rugged smartwatch powered by Google’s Wear OS and is equipped with GPS (including GLONASS and Michibiki), sensors (pressure sensor with altimeter and barometer, accelerometer, gyrometer, compass), and a dual-layer display with a 1.2-inch color touch OLED display and power-saving monochrome LCD display. The debut models include the WSD-F30-BU (blue), WSD-F30-RG (orange), and WSD-F30-BK (black) with availability on January 18, 2019. Each model has a MSRP of $549 USD. 1. The WSD-F30 has a smaller case which is 3.9 mm narrower and 0.4 mm slimmer than the WSD-F20. The total measurements are 60.5 x 53.8 x 14.9 mm and 83 grams. 2. The WSD-F30 uses a new algorithm for optimizing power management. In the new “Extended” mode, offline color maps and GPS logging can be used for up to three days (assuming eight hours of GPS logging and map display use per day). Standard mode with Bluetooth and Wi-Fi enabled and GPS disabled will get up to one and a half days of battery life. In “Multi Timepiece Mode” displaying time and sensor data on the monochrome display similar to other Pro Trek digital watches and with Wear OS disabled, the battery can last up to one month. 3. 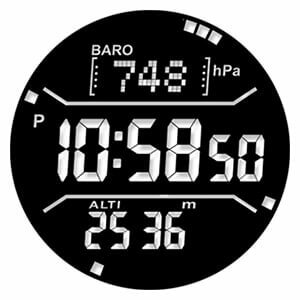 More information is now available on the monochrome display including atmospheric pressure, altitude, and compass bearing. 4. The WSD-F30 has a 1.2-inch OLED 390×390 color display which is an improvement over the WSD-F20’s TFT LCD 320×300 display. It appears that the WSD-F20 and budget WSD-F20A models will remain in the Pro Trek Smart lineup along with the WSD-F30. Casio mentioned that the WSD-F20 has achieved four times the sales of the original WSD-F10. Though there are no game-changing new features on the WSD-F30, a smaller form factor with a superior display, better battery life, and a more informative monochrome display are certainly welcome additions to what was already a capable outdoor smartwatch. 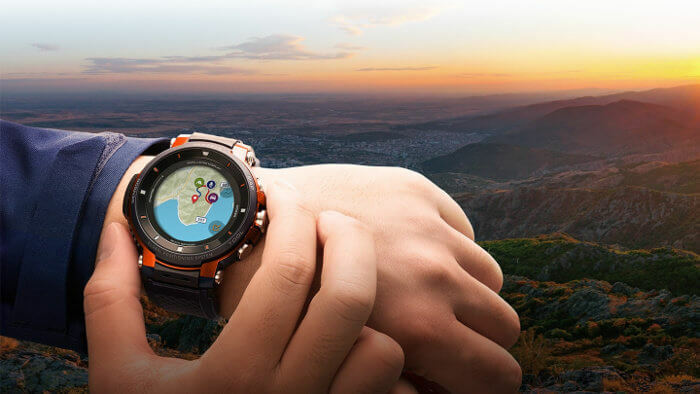 Representatives from app publishers of Casio’s showcase of outdoor and fitness-oriented Wear OS apps also made brief presentations during the press conference. These apps included ViewRanger (navigation), Hole19 (golf), Glassy (surfing and water sports), Fishbrain (fishing), MySwimPro, Equilab (horse riding), Exercise Timer, Zombies, Run! (fitness game), and Ski Tracks. Wear OS by Google is compatible with smartphones running Android 4.4+ (excluding Go edition) or iOS 9.3+. Miles Barr, Engineering Director of Wear OS, also spoke briefly about the latest upgrades to Wear OS. These improvements include quicker and simpler access to notifications, a more impactful and accessible health experience with a new Google Fit including two new activity goals, and a more personalized Google Assistant experience which is accessible by swiping right. 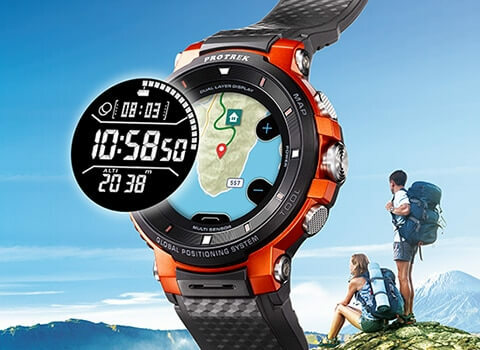 Visit the official Pro Trek Smart WSD-F30 site at wsd.casio.com. Update: Casio announced a January 18, 2019, release date for the WSD-F30. Casio is also releasing the WSA-BX1, an extra-long cloth band for the WSD-F30 that will allow the watch to be worn over outdoor clothing such as jackets and coats. The band can be easily swapped with the standard resin band. Casio also announced a partnership with Bikemap, the world’s largest bicycling map app. Utilizing the WSD-F30’s built-in GPS, Bikemap allows users to download maps and routes and use the app without being connected to a smartphone. The app saves activity records such as the route, speed, distance, and time. Not sure, they didn’t say and it’s not listed in the official specs. Probably the same as WSD-F20. Casio finally got rid of the flat section on the bottom of the display with this version, which is a good thing. Great and respect for Casio again!!! It would be perfect if it had tough solar!! !